NEW DELHI, India—Modern agricultural technology and modernization could help double the current incomes of farmers within six years, according to Indian Prime Minister Narendra Modi. He expressed this possibility during the inauguration of the Krishi Unnati Mela agriculture fair and exhibition, held 19-21 March at Pusa, New Delhi. “The next revolution in Indian agriculture has to be built on technology and modernization,” Modi emphasized. He also gave a clarion call for a second green revolution in the eastern states through the adoption of modern technologies. 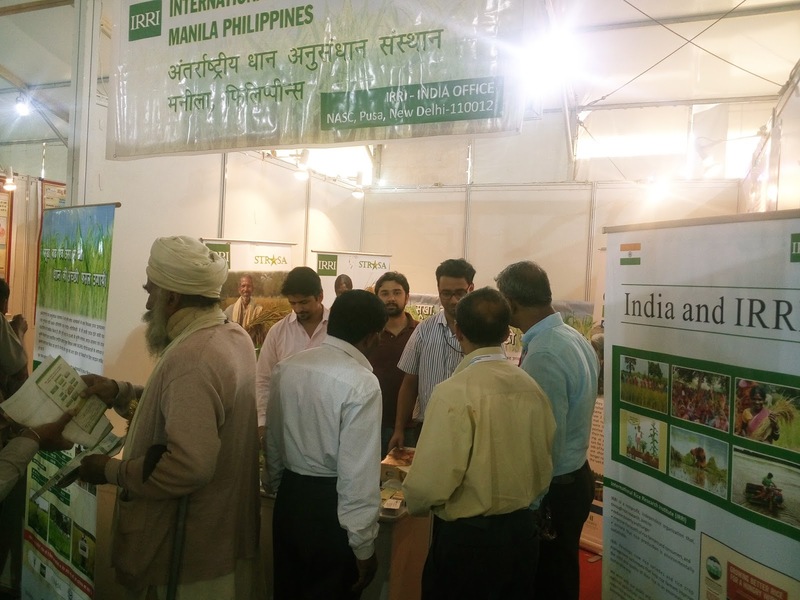 During the mega event, farmers from various Indian states visited the exhibit of the International Rice Research Institute (IRRI; photo). The exhibit showcased various technologies developed and promoted by the institute for Indian farmers through the Stress-Tolerant Rice for Africa and South Asia (STRASA) and the Cereal Systems Initiative for South Asia (CSISA) projects. These included stress-tolerant rice varieties (STRVs), Crop Manager for Rice-based Systems, publications on seed production and postharvest techniques, a manual rice transplanter, the Community Mat Nursery, and the performance charts for the STRVs. IRRI representatives, Mr. Mayank Sharma, Mr. Sarovar Yadav, and Mr. Amit Mishra gave demonstrations and explanations on the various IRRI technologies. Farmers who are already cultivating STRVs shared their experiences and suggestions, particularly those from Uttar Pradesh and Bihar. Farmers from these two states were very satisfied with the performance of the drought-tolerant Sahbhagi dhan as their areas experienced severe drought last year. The farmers were interest in other recently released varieties such as BINA dhan 11, DRR42, DRR44, Sambha-Sub1, among others. Other visitors to the IRRI display were Union Ministers Shri Radha Mohan Singh and Shri Nitin Gatkari, officials from the Ministry of Agriculture, agricultural scientists, and extension agency personnel. 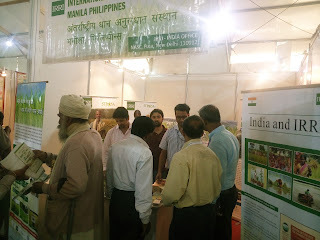 Krishi Unnati Mela was organized jointly by the DoA, Ministry of Agriculture and Farmers' Welfare, and the Indian Agriculture Research Institute (IARI). in suboptimal rice environments of Indonesia. BOGOR, Indonesia—"No matter how many varieties we develop, if farmers do not plant them, our efforts to raise productivity in suboptimal rice environments will have no meaning." This was the message of Hasil Sembiring, director general of the Directorate of Food Crops, Ministry of Agriculture in Indonesia, during a consolidation-workshop on upscaling technological innovation in suboptimal rice environments of Indonesia, held 11 March. The activity, the first ever held in Indonesia, aimed to focus efforts on reaching out to poor farmers in suboptimal environments. In the past, the government had addressed productivity mainly in irrigated rice areas that comprise nearly 60% of the country’s total rice production area. Recently, the government has directed its resources to meet its target seed production for 2016-17 and it has included rainfed lowland (27.7%), swampy (8.8%), and upland (5.3%) areas. Sembiring, a former director of the Indonesia Center for Rice Research (ICRR) and steering committee member of the Consortium for Unfavorable Rice Environments (CURE), has been calling for increased production to improve the livelihood of farmers severely affected by climatic variability. He has strongly supported efforts to develop climate-resilient varieties and community seed banks. The workshop, held at the IPB International Convention Center in Bogor, was organized by the directorate in cooperation with ICRR and CURE. The purpose was to speed up the delivery of suitable seeds of newly released stress-tolerant rice varieties and the associated best management practices specifically suited for unfavorable environments in upland, swampy, rainfed, and flood-prone areas. "CURE's role is to catalyze and encourage national governments to foster the scaling up of technological innovation developed out of the current partnerships," said Dr. Digna Manzanilla, CURE coordinator. One workshop recommendation is to further strengthen collaboration among ICRR, the Indonesian Swampland Agriculture Research Institute (ISARI), and CURE to develop best management practices. Ali Jamil, incumbent ICRR head, expressed his confidence in the appropriateness and readiness of technologies intended to raise productivity in Indonesia’s suboptimal environments. These appropriate technologies include varieties; soil, water, weed, pest, and disease management; fertilizer recommendations; and postharvest practices. Also, a demo for the Seed Multiplication Program, which is targeting 2 million hectares, will be pursued via "1000 self-sufficient seed villages" (or DMB, an Indonesian acronym) to encourage and increase seed production for upland varieties in selected provinces. DMB will financially support the purchase of starter and foundation seeds from the Assessment Institute for Agricultural Technology while the directorate seed program will use starter and extension seeds for food crops. The seed production unit of the Field School of Food Kedaulatan, integrated with the DMB, ICRR, and the Directorate of Seed, has started seed multiplication of stress-tolerant rice varieties to support the effort in 2016. Zaini Zulkifli, representing the International Rice Research Institute (IRRI) in Indonesia, has been instrumental in making the consultation possible. He highlighted some technologies such as seeds, machinery, crop establishment, and crop and natural resources management. Casiana Vera Cruz and Yoichiro Kato, working group leaders of CURE, also joined the consultation. A coordination meeting to re-examine the strategies for seed multiplication to develop working mechanisms and a timeline for producing seeds for the coming season was set for September 2016, according to Dr. Nandang Sunandar, director for cereals at the Directorate of Food Crops. Attending the workshop (photos) were representatives of the Directorate of Food Crops, Directorate of Seed, Directorate of Cereal Crops, Indonesia Center for Food Crops Research and Development, Indonesian Center for Agricultural Technology Assessment and Development, ICRR, IRRI, and CURE. Also represented were the Swampland Agriculture Research Institute and representatives of the Assessment Institute for Agricultural Technology in Riau, South Sumatra, Banten, Lampung, and West Java as well as local government units of South Sumatra, Lampung, Banten, West Java, East Java, and South Kalimantan. LOS BAÑOS, Philippines—In 2016, South Korea celebrates 100 years of science and technology by recalling the storied history of its miracle rice called Tongil (or Tong-Il). The rice is viewed by many as one of the country's most important scientific achievements in the 20th century. The Korean Broadcasting System (KBS), the national television and radio broadcaster of South Korea, filmed a documentary at the headquarters of the International Rice Research Institute (IRRI) that highlights the strong partnership between South Korea and the institute. South Korea has been collaborating with IRRI through the Rural Development Administration (RDA) since the 1960s. Their work has included crossing temperate japonica rice varieties with tropical indica varieties. This produced Tongil, a rice variety developed at IRRI, which helped transform Korea from being a rice importer to a self-sufficient producer. “Through the documentary, we are seeking to share with Koreans around the world and the international community how our people were, with the help of IRRI, freed from hunger following the devastation of the Korean War,” said Jea Hyuk Lee, KBS producer. A reenactment at IRRI's Zeigler Experiment Station presents the late Dr. Mun-Hue Heu, the father of the Korean Green Revolution, and Dr. Hank Beachell, then head of IRRI's Plant Breeding Division. The two scientists were instrumental in developing Korea's miracle rice. The film also features interviews with Dr. Bruce Tolentino, IRRI deputy director general for communication and partnerships; Dr. K.K. Jena, IRRI scientist and newly appointed Korea RDA honorary scientist and advisor; and Julian Lapitan, former head of Partnerships at IRRI and incumbent president of the Philippines RDA Alumni Association. Dr. Ruaraidh Sackville Hamilton, head of the T.T. Chang Genetics Resources Center and International Rice Genebank, provided the filmmakers with a tour of the genebank. The genebank contains more than 127,000 rice varieties from all over the world, including Tongil. The documentary was filmed on 28-29 March. The episodes featuring IRRI will air on 21 April on KBS TV. 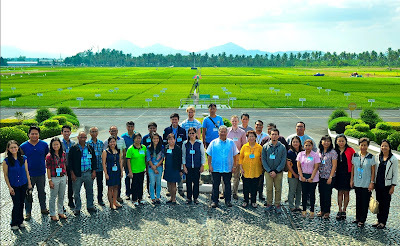 LOS BAÑOS, Philippines—Some of the world’s top rice scientists presented the latest developments in rice research during the 9th annual meeting of the Hybrid Rice Development Consortium (HRDC) held 30 March-1 April, at the International Rice Research Institute (IRRI). Dr. Jacqueline Hughes, IRRI’s new deputy director general for research, welcomed 81 participants including consortium members from the private and public sectors. They selected more than 2,000 hybrid breeding lines for use in their own breeding programs. Dr. Fangming Xie, HRDC coordinator and senior scientist, presented research updates on hybrid rice and reported on progress with the multilocation replicated yield trial. Charisse Grace Piadozo-Arlegui, HRDC assistant coordinator and assistant manager, also provided updates. technologies for precision breeding at IRRI (Dr. Tobias Kretzschmar). On the participants' schedule were visits to IRRI’s hybrid rice yield trial and the CMS (cytoplasmic male sterility) demonstration plot, the consortium’s multilocation field trial, the rainout shelter for drought tolerance of rice, and the newly built Lloyd T. Evans Plant Growth Facility. Through the partnership platform of the HRDC, IRRI works with national agricultural research and extension systems and the private hybrid rice seed sector in promoting research on hybrid rice. Formed in 2008, the consortium aims to make better hybrids more widely available to rice farmers to raise the income of farmers, make rice production more efficient and sustainable, and keep rice affordable for millions of people who depend on it as a staple food. Municipal and provincial local government units (LGUs), farmers in the Cordillera Administrative Region (CAR), and a team from the Heirloom Rice Project (HRP) met in Banaue, Ifugao, 16-17 March (photo). They discussed business plans, market linkages, Geographical Indication (GI) registration, and other market-related concerns as the project moves forward into the third and final year of phase 1. The GI registration for heirloom rice varieties was also tackled. The group discussed the critical dimension of using the traditional names of heirloom rice varieties for registration. The GI tag ensures that only registered users residing within the geographic territory are allowed to use the product name. The GI tag also puts premium importance on traits linked to specific cultural origins. DAVAO CITY, Philippines—More than 100 researchers from local, national, and international organizations on rice (photo) gathered for a National Workshop on Crop Health Assessment for Regional Implementers, 14-17 March. They shared updates on the collection of data on rice production situation, injuries caused by pests and diseases, and yield in the different rice areas of the Philippines. The participants gained insights on the results of field surveys and farmer interviews done during the second semester of 2015 under the Philippine Rice Information System (PRISM) project. They were also able to report and review accomplishments, work plans, and the effects of El Niño in the regions and tested the updated recording forms by collecting crop health data in farmers’ fields. Hands-on training on computing the incidence pest injuries and diseases in a farmer's fields was also on the agenda. The participants shared their knowledge and expertise with other farmers during a farmers’ forum. Joining the forum were farmers and local leaders from the municipality of Braulio Dujali, Davao Del Norte, where the field exercise was conducted. For the crop health assessment component, regional partners from the Department of Agriculture-Regional Field Office (DA-RFO) and the local government units conducted surveys in farmers’ fields using a standardized procedure developed by the International Rice Research Institute (IRRI). The procedure included assessment of injuries caused by animal pests, pathogens, and weeds; characterization of the production situation; and yield quantification. These surveys provide information on pest risks and pest management strategies and support the project’s component on mapping and monitoring of rice areas. Under the auspices of the DA, the Philipipine Rice Research Institute (PhilRice), and IRRI, PRISM, a four-year collaborative project under the Food Staples Sufficiency Program (FSSP), aims to support decision-making toward food security throughout the Philippines. It is developing an operational monitoring system that can provide accurate, timely, and reliable information on rice. The project relies on data from its two main components: mapping and monitoring and crop health assessment. The workshop was held under PRISM's crop health component. Participants came from the regional offices of the DA, local government units, PhilRice, and IRRI. The workshop was jointly organized by IRRI, PhilRice, and the DA’s regional field office in Region XI. LOS BAÑOS, Laguna—“In addition to bioenergy, a profitable use for rice straw is in mushroom production,” said Craig Jamieson, a bioenergy expert, during a multi-stakeholder workshop organized by the International Rice Research Institute (IRRI)-SuperGen Rice Straw Energy Project, held at IRRI headquarters on 21 March. Rice straw, a byproduct of rice cultivation, is one of the world’s most abundant resources for biomass energy. Despite this, most of the rice straw left over after cultivation is burned in the field for disposal. Growing mushrooms on rice straw can help break down the straw making it more suitable for anaerobic digestion. Anaerobic digestion produces biogas, which can in turn be used as an alternative energy source for cooking, generating heat for drying, and producing electric power. Attending the workshop were representatives from Philippine research institutions, universities, traders, producers, NGOs, and the private sector (photo). It was an opportunity for the participants to identify the barriers to using rice straw for mushroom production in the country and how to overcome them. The participants also explored strategic ways for stakeholders to collaborate in reaching shared goals. SUWON, South Korea—Dr. Kyu-Seong Lee has been named director general of the Department of Central Area Crop Science under the National Institute of Crop Science (NICS) of the Rural Development Administration (RDA) of South Korea, effective 7 March 2016. Lee has excellent leadership abilities and extensive experience in research and management. He has a distinct capability of developing new agricultural technologies for the future. As director general, Lee will be responsible for improving crop breeding for rice, barley, wheat, and potato; creating new value-added products from these crops; improving the crops and making cropping systems more profitable while responding to climate change and enhancing sustainable agriculture. Lee was a former director general of the Department of Agricultural Biology, National Academy of Agricultural Sciences (NAAS), RDA in Jeonju City. Before his position at NAAS, Lee worked as a scientist at the International Rice Research Institute, seconded in RDA. MANILA, Philippines—Reliable information based on satellite data and ground observations can help the Philippines prepare for and mitigate the effect of recurring disasters, such as typhoons and El Niño. Since 2014, the Philippine Rice Information System (PRISM) has been providing the Department of Agriculture (DA) with timely seasonal data on rice area and yield and assessment of crop health and damage in the event of a typhoon, flood, or drought. In its first annual executive meeting on 31 March, PRISM will present its achievements and activities to a wider audience. High-level officials including Senator Cynthia Villar, Agriculture Secretary Proceso Alcala, DA undersecretaries, and other stakeholders will attend the event. “PRISM uses remote sensing, crop modeling, cloud computing, and smart phone-based surveys for rice mapping and monitoring,” said Alice Laborte, who leads the PRISM project at the International Rice Research Institute (IRRI). PRISM, one of seven projects under the Food Staples Sufficiency Program (FSSP), is a collaborative project among IRRI, Philippine Rice Research Institute (PhilRice), and the DA. The development and implementation of PRISM in the Philippines are funded under the DA's National Rice Program. “The rice maps derived from satellite images are being validated through field surveys where we enjoin and train local field technicians from the DA’s regional field offices, local government units, and, in some cases, farmers to gather the data,” explained Laborte. “This activity provides a way for us to assess the accuracy of PRISM products while helping to build the technical skills and capacity of our partners. Our rice maps for the 2015 wet season, for example, have an overall accuracy of 85%, based on 2,223 validation points throughout the country." From the 2014 and 2015 cropping seasons, 443 satellite images across the country were acquired and used in rice area mapping and damage assessment. Some of these images were used to map flood-affected parts of Nueva Ecija where last year’s Typhoon Koppu hit and to assess drought-affected areas in Mindanao since last year due to the prolonged El Niño. "These pieces of information are very useful in improving damage and loss assessments to assist in providing appropriate interventions for rehabilitation and recovery and to improve predisaster preparedness,” said Engr. Christopher V. Morales, DA field operations service OIC-director. Pests and diseases can damage nearly 40% of the rice crop in Mindanao. Recent information on crop health, such as intensities of injuries caused by pests and diseases and cropping practices of farmers, will also be presented during the meeting. This information is based on data collected by project partners who use smartphone applications, which are useful tools for gathering and submitting the data to a server in real time. "Through PRISM, we can use the power of remote sensing. This is a breakthrough in rice history,” said Jimmy Quilang, deputy executive director for research and PRISM project leader at PhilRice. “Given various locations, planting dates, and effects of extreme weather events, we can now have a better, faster, and accurate assessment of rice areas, yield estimates, and forecast. These valuable information will help our decision makers to act immediately and implement adjustments and improvement on food security plans." To be continued by the DA beyond 2017, the PRISM project is a pioneering achievement as the Philippines is the first country in Southeast Asia to have such an operational system. The rice fields of Vietnamese farmers in the Mekong River Delta (MRD) and other coastal areas have recently been undergoing acute drought and salt water intrusion. However, according to scientists at the International Rice Research Institute (IRRI), these problems can be foreseen and viable options are being made available to help farmers cope and avoid production and income losses. Presiding at a recent workshop, Cao Duc Phat, Vietnam’s Minister of Agriculture and Rural Development (MARD), expressed deep concern about these ongoing disasters, hence, the discussion on possible solutions and resources in the short- and long-term. Across the country, hundreds of hectares of rice paddies have already been affected by salinity and drought. Salinity is driven mainly by lack of rainfall. The El Niño phenomenon worsens the condition. In 1998 and 2010, severe salinity intrusion occurred in Vietnam. Each of these intrusions took place one year after an El Niño event. Since 1965, the second most severe El Niño, worldwide, occurred in 2015. Observations during the recently concluded IRRI project, Climate Change Affecting Land Use in the Mekong Delta: Adaptation of Rice-based Cropping Systems (CLUES), point more to decreasing upstream flows as a significant cause of increased salinity and not much due to sea-level rise. “Within the next 30 years, 40% of the MRD will be affected by salt intrusion,” said Ngo Dang Phong, CLUES’ project facilitator. High salinity causes rice “burnt-out” or white leaf tip followed by tip burning and chaffy panicles, which leads to significant yield reduction. Building on previous studies with local partners, IRRI has various recommendations to combat both salinity and drought. In the CLUES project, new breeding lines that are salt- and submergence-tolerant were developed and tested for their suitability in the MRD. 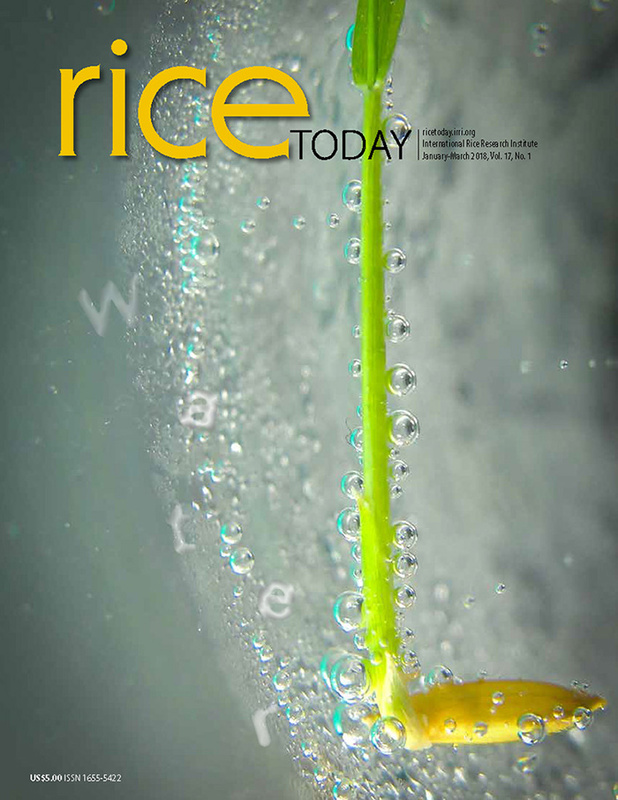 “In high-risk areas for salinity, the development and delivery of short-duration, good quality rice with enhanced salt tolerance should be fast-tracked,” said Tuong. For decades, Vietnamese farmers have been intensively planting three crops per year. However, to avoid salinity, it may be more appropriate to plant two long-duration rice crops annually rather than grow three short-duration crops. During periods of drought, alternate wetting and drying (AWD) and other water management practices can be adopted along with the use of suitable varieties. Because AWD involves flooding and re-flooding of paddy fields at specific time periods, this reduces the risk of using saline irrigation water. “Currently, IRRI and Can Tho University are implementing a salinity advisory as part of the Location-specific Timely Service (SALTS) subproject for rice farmers that is part of a BMZ Small Grant Project. “Using information and communication technology (ICT), SALTS aims to provide real-time, location-specific salinity monitoring and advisories, including rainfall forecasts,” said Paolo Ficarelli, IRRI ICT expert. Leocadio Sebastian, IRRI’s country representative to Vietnam and regional program leader of the CGIAR Research Program on Climate Change, Agriculture, and Food Security (CCAFS), added that the climate-smart agriculture approach should be considered in the country’s medium- and long-term plans for climate change adaptation and mitigation. Vietnam has been a global leader in rice production and IRRI has been working closely with the government to improve continuously its rice sector and make it more sustainable and climate change-resilient. In relation to this, the institute has extended some technical assistance to the development of Vietnam’s Rice Restructuring Strategy, which explicitly states collaboration in developing rice varieties with high export value, adopting advanced crop management techniques, and more intensive use of machines and other technologies in rice farming. DHAKA, Bangladesh—“Through enhanced water and crop management using a community approach, we have great opportunities to improve food security in the polder communities on the southwestern coast of Bangladesh,” said Sudhir Yadav, a scientist at the International Rice Research Institute (IRRI), in anticipation of the impact of a recently launched project. The project, Unlocking the production potential of polder communities in coastal Bangladesh through improved resource-use efficiency and diversified cropping systems, aims to usher self-sustaining economic growth and reduced poverty in the country's coastal communities. The project was initiated under the flagship of USAID’s Feed theFuture (FtF), the Sustainable Intensification Innovation Lab (SIIL) of Kansas State University (KSU), and IRRI in partnership with BRAC. Bangladesh constructed polders (low-lying tracts of land enclosed by dikes) in the 1960s to protect coastal agricultural lands from tidal flooding and reduce salinity incursion. They also reduce long-term flooding and waterlogging caused by storm surges. The initiative aims to respond to the challenges in these coastal areas by planning, evaluating, and supporting adoption of practical farming approaches for efficient use of available resources. “But the end goal of these activities is to improve food security, human nutrition, and livelihoods of these communities,” stated Yadav. SIIL Director Vara Prasad underscored the overall goal of improving the productivity, income, and nutrition of smallholder farmers. He also highlighted the importance of interdisciplinary research, knowledge sharing, and capacity building for sustainable intensification. Hamidur Rahman, director general of Bangladesh's Department of Agricultural Extension, expressed his appreciation to the donors, KSU, and IRRI for this timely initiative. He added that the project matched the government’s initiative to improve the productivity of southern Bangladesh over the next five years. Over this period, the project will focus on evaluating options for increasing cropping intensity and farm productivity through the best use of available resources and mechanization. Along with improved production systems, the project will also be promoting nutritional enhancement and creating new income-generating opportunities for poor women and landless farmers in the polder communities. Part of the strategy of the project is to work closely with different agricultural universities to mentor the next generation of scientists. Participants (photo) of the inception workshop included representatives from national organizations such as DAE, BRAC, Bangladesh Water Development Board, Bangladesh Institute of Nuclear Agriculture, Bangladesh Rice Research Institute, Bangladesh Agricultural Research Institute, and Institute of Water Management. Other participating international organizations working in the region include the World Fish Center, International Maize and Wheat Improvement Center, and the BlueGold project of the Dutch Government. PMCP President Jesus Asistin (left), Jhoana Opeña, and Dr.
NAGA CITY, Philippines—Two up-and-coming scientists were recently cited for their outstanding contributions to the management of major weeds that significantly affect rice production in Asia and the Pacific. Jhoana Opeña (photo), an assistant scientist at the Weed Science Unit of the Crop and Environmental Sciences Division, International Rice Research Institute (IRRI), received the Marcos R. Vega Memorial Award in Weed Science. The recognition was given for her research on the development of integrated weed management strategies in rice and rice-based cropping systems. 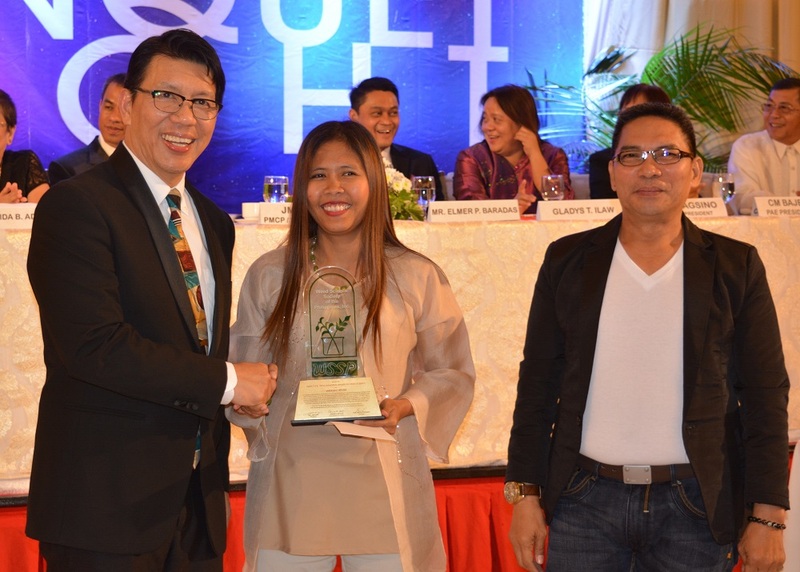 Edelyn Joy Vicencio, an undergraduate student from the University of the Philippines Los Baños (UPLB) and IRRI affiliate research scholar, received the Best Undergraduate Thesis Award in Weed Science from the Pest Management Council of the Philippines, Inc. (PMCP). Her study, Effect of early submergence on the survival of and growth of submergence-tolerant rice and weed species, focused on the effect of different submergence depth and duration of submergence on the early seedling stage of three rice cultivars and economically important weeds of rice in the Philippines. 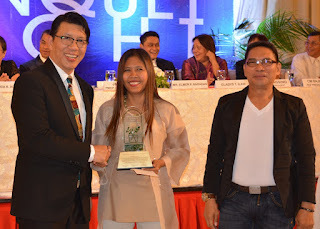 Her advisers, Niña Gracel Dimaano, UPLB instructor, and Dr. Virender Kumar, senior weed scientist at IRRI, were also recognized for their exemplary guidance. Opeña and Vicencio belong to the new generation of weed scientists who are expected to play vital roles in advancing the development of pest and weed management in the Philippines and the Asia-Pacific region. The awards were presented during the 47th PMCP anniversary and annual scientific conference in Naga City, Camarines Sur on 8-11 March. This year’s theme was Sustainable pest management for today and tomorrow. LOS BAÑOS, Philippines—Farmers, media practitioners, researchers, and scientists from various Asian countries recently received an overview of how the nutrient content of rice could be increased through genetic engineering. Violeta Villegas, senior scientist at the International Rice Research Institute (IRRI) and Golden Rice Network coordinator, explained the crucial role of gene modification (GM) technology in rice research in her presentation during the Asian Farmers Exchange Program 2016 held at IRRI on 16 March, Recognized as a pioneer for genetically modified crops in Asia, the Philippines was chosen as the venue for the 2016 program. Golden Rice is a new type of rice that contains beta carotene, a source of vitamin A. It is being developed as a potential new food-based approach to improve vitamin A status. IRRI, the coordinating institution for the Golden Rice Network, has been working with national partners since 2006. Developing healthier rice varieties to reduce micronutrient deficiency or hidden hunger is part of IRRI’s mission, added V. Bruce J. Tolentino, IRRI deputy director general for communication and partnership (photo). Around 30 participants from the Philippines, India, South Korea, Vietnam, Malaysia, and Thailand attended the annual event organized by CropLife Asia and the Biotechnology Coalition of the Philippines (BCP). The exchange program is a major initiative to sustain the dialogue, share knowledge, and build linkages among farmers and NGO leaders. It aims to form a strategic Asian alliance for greater advocacy and for the benefit of poor Asian farmers. CropLife Asia is part of a global federation representing the plant science industry that supports innovation, research, and development in agriculture through the use of biology, chemistry, biotechnology, plant breeding, and other techniques and disciplines. The BCP is a nonstock, nonprofit membership association. The broad-based, multi-sectoral coalition advocates the safe and responsible use and advancement of modern biotech in the Philippines. Members are representatives from the science and academic communities, farmers’ and church organizations, industry, and the media. JEONJU, South Korea—The Rural Development Administration (RDA) of South Korea has appointed Kshirod K. Jena as honorary scientist and adviser on agricultural science and technology effective from January 2016 through December 2018. 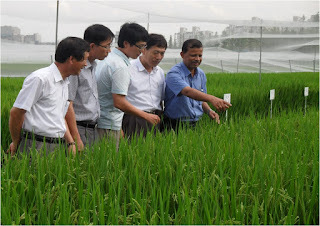 Jena (far right in blue shirt in photo), a principal scientist at the International Rice Research Institute (IRRI), received the appointment from RDA Administrator Yang-ho Lee. Jena worked with IRRI’s partners in South Korea through RDA for more than 10 years. He contributed significantly to the improvement of the country’s elite japonica varieties by making these varieties pest- and disease-resistant as well as cold-tolerant. His work on ANMI, an improved high-yielding japonica variety that has BPH resistance, is also a noteworthy part of his research. “Anmi” means safe and delicious because it requires less pesticides and its quality is preferred by consumers. Also worth mentioning is Jena’s significant contribution to the Temperate Rice Research Consortium (TRRC), a partnership platform for the development and improvement of japonica rice. RDA has been supporting TRRC since its founding in 2007 in Suwon, South Korea, with annual funding of USD 190,000. South Korea has been collaborating with IRRI through RDA in breeding temperate japonica rice variety with tropically grown indica variety. As a result, this produced the rice variety Tong-il, which transformed Korea in the 1970s from a rice importer to a self-sufficient producer. LOS BAÑOS, Philippines—Scientists from leading research institutions met to discuss the latest developments in managing weeds that greatly reduce rice yields. 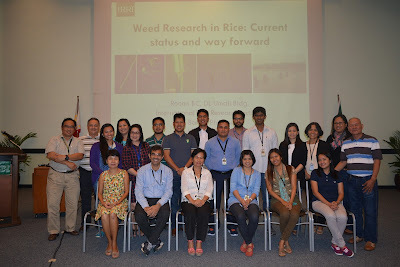 Weed scientists from the Philippine Rice Research Institute (PhilRice), the University of the Philippines Los Baños (UPLB), and the International Rice Research Institute (IRRI) participated in a meeting on Weed research in rice: Current status and way forward. Held 29 February at IRRI headquarters, the meeting was a venue for weed scientists to discuss recent research, emerging issues, knowledge gaps, and new areas of research and collaboration on weed management. “One of the key agricultural changes in the last 10 years is the increased adoption of direct seeded rice (DSR) because of increasing labor scarcity and rising labor wages,” said Leylani Juliano, an agronomist, who presented the status of on-going weed research at PhilRice. Although DSR has helped many farmers who are facing labor scarcity, weeds have become a major challenge in these areas. The problem of weedy rice—a highly competitive and difficult-to-control weed—has emerged as a major threat to DSR systems. Dr. Virender Kumar, IRRI senior weed scientist, discussed factors influencing the direction of weed science research in rice at the institute. Dependence on herbicides for weed control has increased, posing higher risks of herbicide resistance. “Developing diverse, integrated weed management solutions and an effective dissemination strategy are the keys to the sustainability of the technology and for harnessing the full benefits of DSR systems,” he said. Dr. Aurora Baltazar, an adjunct weed science professor at UPLB, mentioned the need to have a more comprehensive documentation of the emerging weed problems, herbicide usage, and the development of herbicide-resistant weeds over time across the country. So, the participants agreed to come up with a wide-ranging review of Weed science: Current research and future needs for the Philippines through joint refereed journal publication. In addition, scientists identified potential research areas for collaboration including: 1) developing a weed management module to integrate with Rice Crop Manager and evaluating the advantage of this module on yield and net income; (2) exchanging knowledge and demonstrations of innovative weed management methods for weed control in DSR, (3) surveying the extent of the weedy rice problem and other emerging weed problems and developing management solutions, (4) characterizing and quantifying potential new herbicide resistance cases, and (5) capacity building for developing the next generation of rice weed scientists. BIHAR, India—Stress-tolerant rice varieties, high-quality seed production, and postharvest techniques were showcased at a farmers’ fair attended by thousands of farmers, scientists, and extension workers from the different districts of Bihar. The kisan mela (farmers’ fair), organized by the Bihar Agricultural University (BAU), highlighted the achievements of the university and honored innovative farmers of the state. This year’s theme was Soil Health Management and Sustainable Agriculture. The International Rice Research Institute (IRRI) had an exhibit booth at the fair to promote the technologies developed by the Stress-Tolerant Rice for Africa and South Asia (STRASA) project and the Cereal Systems Initiative for South Asia (CSISA). The STRASA team introduced newly released drought-tolerant rice varieties (DRR 42, DRR 44, and Bina Dhan 11) to farmers and extension workers. The team also explored the possibility of partnerships with other stakeholders, especially in the speedy dissemination of stress-tolerant rice varieties into the state's stress-prone areas. Also on display were technologies and products developed by the Improved Rice-based Rainfed Agricultural Systems project such as the manual transplanter, the community mat nursery, and performance charts of stress-tolerant rice varieties. The Crop Manager for Rice-based Systems (CMRS), a recently developed technology customized for the Bihar region, was also demonstrated. CMRS aims to increase farmers' net income and sustain the productivity of rice-based cropping systems. 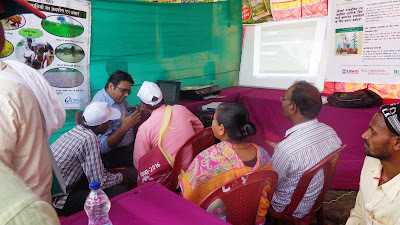 As part of the demonstration, hundreds of fertilizer recommendations were generated with a detailed discussion with the concerned farmers. Additionally, various information materials on the management of stress-tolerant varieties, seed production, and postharvest techniques were distributed to participating extension workers and farmers. The IRRI booth, one of the most popular exhibits, won second place for Best Booth. The IRRI team included Dr. Amit Mishra, Mr. Mayank Sharma, Mr. Sarvesh Shukla, and Mr. Bhanu Pratap Bhadauria, all based in India. The kisan mela, held at BAU, 4-7 March, was inaugurated by Bihar Chief Minister Nitish Kumar. LOS BAÑOS, Philippines—“Women rice farmers in Southeast Asia are more empowered compared with women in other developing countries,” said Pieter Rutsaert, a social scientist at the International Rice Research Institute. The CORIGAP (Closing rice yield gaps in Asia with reduced environmental footprint) project, for which this study was carried out, aims to close rice yield gaps while reducing the environmental footprint in the major rice granaries in Asia. “Compared with women in South Asia and Africa, women rice farmers in Southeast Asia have good decision-making power at the household level,” said Rutsaert. Both husband and wife work in the rice fields and share resources. For example, the income of both is pooled into the family’s income. A woman manages this income independent of how much she contributes to it. Community-level decision making is a different story. The study revealed that, at the community level, women in Thailand and the Philippines have a strong voice and good access to information and extension services. In Indonesia and Myanmar, however, women don’t have a lot of voice in community decision-making. Understanding what is at play at the community level also has implications for agricultural practices. In Indonesia, for example, decisions about variety selection, planting dates, and irrigation schedules are made on a community level where women have no voice. Moreover, Indonesian women have very limited access to information and extension services. Dr. Mangina Venkateswara Rao (1928-2016), renowned agricultural scientist and one of the key persons in India’s ‘Green Revolution, passed away on 8 March in Hyderabad. He was a member of the Board of Trustees of the International Rice Research Institute (IRRI) from 1984 through 1989. During the early 1960s, Rao was involved in testing and identifying the best varieties of wheat from Mexico that were then grown in India and changed the country's agriculture scenario forever. A recipient of the Norman Borlaug Award and the Linker Award, Rao was also honored with India's Padma Shri. In his contribution to Rice Today magazine's April 2015 issue devoted to Celebrating 50 years of rice research in India, Rao wrote, "India greatly benefited from training its scientists at IRRI through short-, medium-, and long-term assignments. India received considerable value from this international collaboration and I hope it will continue to address additional challenges such as malnutrition, climate change, water shortage, and producing more rice with fewer inputs." Read more about Rao in The Hindu Business Line, Noted agriculture scientist MV Rao passes away. LOS BAÑOS, Philippines—The contributions of women to rice research and food security were acknowledged during the 2016 International Women’s Day (IWD) celebration on 8 March at the International Rice Research Institute (IRRI). Although movements to increase gender equality have brought women increasing power in the workplace—40% of all IRRI staff worldwide and 36% of nationally recruited staff are women—gender biases persist in many organizations. IWD symposium guest speaker Esther Velasco, team leader of the European External Action Services Instrument for Peace and Stability Gender Facility, challenged IRRI staff to recognize conscious and unconscious gender biases embedded in the organization's culture. “Men and women are assessed very differently," said Velasco. “Women with strong personalities are often criticized as aggressive and over-ambitious while men are never described as over-ambitious.” She challenged IRRI staff to start thinking about such unconscious gender biases based on culture. "Let us continue to inspire leaders to remove these barriers," she emphasized. IRRI Director General Matthew Morell stressed the importance of making the institute an employer of choice for women in research at all levels, from leadership positions through its activities. “We are committed to enhancing gender equity and the role of women at the institute,” he said in a prerecorded message presented at the symposium. A study by the Food and Agriculture Organization showed that in 97 countries, only 5% of women are directly reached by agricultural extension services. “We need to embody gender issues into our research programs not as an afterthought, but as a key part of the planning and project development process,” said Morell. Christine Croombes, head of IRRI's Human Resources Services, encouraged women and girls to achieve their ambition. George Kotch, head of IRRI's Plant Breeding Division, called for a gender-balanced leadership. Inez Slamet-Loedin (photo below), IRRI senior scientist and head of the Genetic Transformation Laboratory, shared her experience as the first Indonesian globally recruited staff at the institute and how important it is to have flexible and inclusive cultures. In addition, Pieter Rutsaert, IRRI social scientist, and Slamet-Loedin participated in a live Periscope broadcast on gender equality. Rutsaert discussed how women rice farmers in South Asia are benefiting from shared resources (view on YouTube). Slamet-Loedin reiterated her views on creating flexible and inclusive cultures (view on YouTube). A poster exhibit, Pledge for Parity, was unveiled at IRRI Headquarters. The exhibit, opened by Croombes and Corinta Guerta, director of External Relations, focuses on the promises of the symposium speakers to further boost gender equality at IRRI. The exhibit is open to the public until 25 March. View a video of the IWD highlights at IRRI. YANGON, Myanmar—Although women’s contributions to Myanmar’s agriculture are limited by gender-based barriers, they are increasingly being tapped as producers of rice seed through the Stress-Tolerant Rice in Vulnerable Environments (STRIVE) project. There is currently a lack of rice seed growers in the country so women rice farmers are starting to train and engage in high-quality seed production. Supported by the U.S. Agency for International Development (USAID) and the International Rice Research Institute (IRRI), the project enlisted women interested in seed production from villages in Yangon in 2014. “We provided them with high-quality seed of stress-tolerant varieties and encouraged them to complete 7-8 days of seed production training on their farm,” explained Dr. Madonna Casimero, IRRI scientist and leader of the STRIVE project. “Now we have at least five successful women rice farmers who earn twice as much by selling high-quality rice seed. “They are also thinking about expanding the area where they are producing seed to more than 1 hectare, which is what the STRIVE project is able to support at the moment,” Casimero added. "Many of these women farmers own more than 1 hectare of rice land, sometimes as many as 10 hectares, which is not uncommon for many farmers in Myanmar. This gives them the opportunity to grow and sell more seed." “Having the skills to produce quality seed and being able to sell and earn a better income has helped empower these women farmers,” said Casimero. “One woman actively mobilized other farmers in her community to practice the principles of good-quality seed production on their farms. CAN THO CITY, Vietnam—A new German-funded project on using rice straw in an environmentally sustainable way could bring income opportunities for farmers. In Southeast Asia, rice straw is a major rice byproduct that is usually burned in the field, a practice that has detrimental effects on the environment and human health. A new project, Scalable straw management options for improved farmer livelihoods, sustainability, and low environmental footprint in rice-based production systems, has been launched in the Philippines, Cambodia, and Vietnam. It aims to provide a holistic approach to identify and promote environmentally sustainable options to manage rice straw while improving livelihoods of smallholder farmers. The International Rice Research Institute (IRRI) and the German Federal Ministry for Economic Cooperation and Development (BMZ) held an inception workshop on 3-4 March in Can Tho City to lay the groundwork. The workshop gathered major public and private stakeholders from the three target countries and project partners from Germany and project satellite countries such as Indonesia and Thailand. They provided updates on the latest rice straw management research activities and initiated the project's strategic collaborative activities. According to Martin Gummert, IRRI senior scientist and project coordinator, the project’s main activities include: (1) assessing different straw management options including value adding potential and environmental footprint, (2) building capacity of farmer intermediaries on providing advisory services for best straw management practices, and (3) providing policymakers with information on creating enabling environments for best practices on rice straw management. These activities will be carried out through interlinked outputs focusing on innovative technologies, management options, and business models; the carbon footprint of mechanization; new technologies such as carbonization of straw that produces biochar; sustainability assessment; and outreach strategies. The Mekong River Delta produces about 10 million tons of rice straw, 10% of which comes from the rice fields of Can Tho province, according to Nguyen Thi Kieu, deputy director of the Department of Agricultural and Rural Development. “Hopefully, this project will come up with practical solutions to manage rice straw as well as increase farmers’ income,” said Nguyen. To initiate outreach, the project linking to IRRI’s existing consortia and projects such as the Closing the Yield Gaps in Asia with Reduced Environmental Footprint (CORIGAP) project, national initiatives such as the One Must Do, Five Reductions in Vietnam, and Better Rice Initiative Asia. Prior to the workshop, Nong Lam University and Cuu Long Rice Research Institute (CLRRI) organized a rice straw baler demonstration and a straw collection and management seminar at CLRRI on 1-2 March. Through these events, workshop participants were able to see the equipment in action and exchange views on currently available rice straw management technologies. The field demonstration and seminar were supported by CORIGAP.